Markets tilted in favour of bears although there was no expansion on the selling action from Friday. The S&P undercut the 20-day MA but volume was down a little on Fridays. 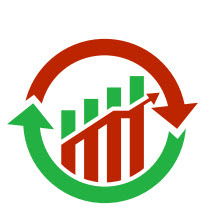 However, the selling did come with a fresh 'sell' trigger in On-Balance-Volume and relative performance against Small Caps is teetering towards a new 'sell' trigger. The Russell 2000 mounted a gentle rollover with a fresh 'sell' trigger in the MACD. There is a +DI/-DI trigger to go with the MACD trigger. Relative performance is still showing a Small Cap underperformance against Technology indices so further losses are still on the cards. 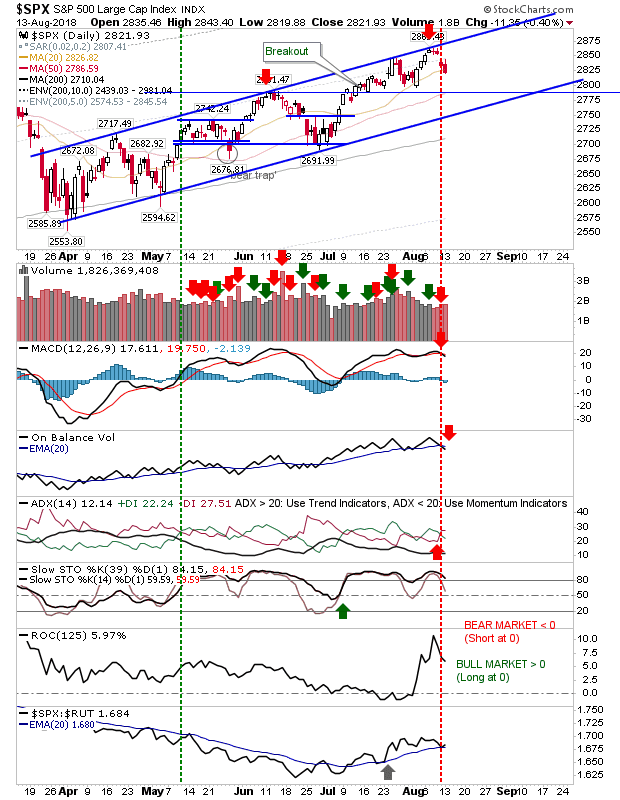 The Nasdaq didn't drop below 7,800 which keeps support intact and the challenge to reverse the 'bull trap' as still valid. Today's action keeps bulls in control despite the loss; buyers of 7,800 support will have welcomed the support hold. A drop below 7,800 is likely to trigger a cascade of stop selling, so value players may want to fish for fills in the 7.760 - 7,780 zone. 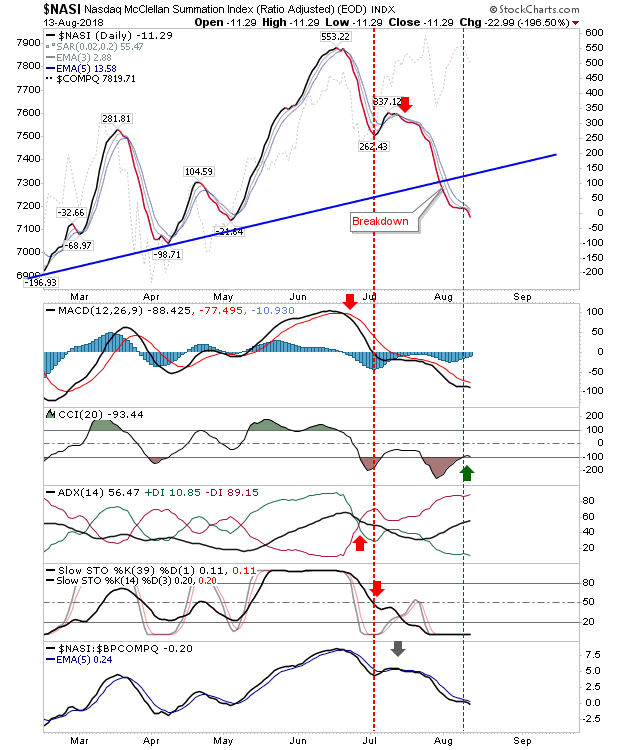 For Tech indices there is the worrying concern of an acceleration in the losses of the Bullish Percent Index; August saw a support break but if this drops below 50% then more stocks will be exhibiting more bearish than bullish action. This will have negative connotations for the Nasdaq and Nasdaq 100; significant market lows kick in when this metric reaches 30% or lower. 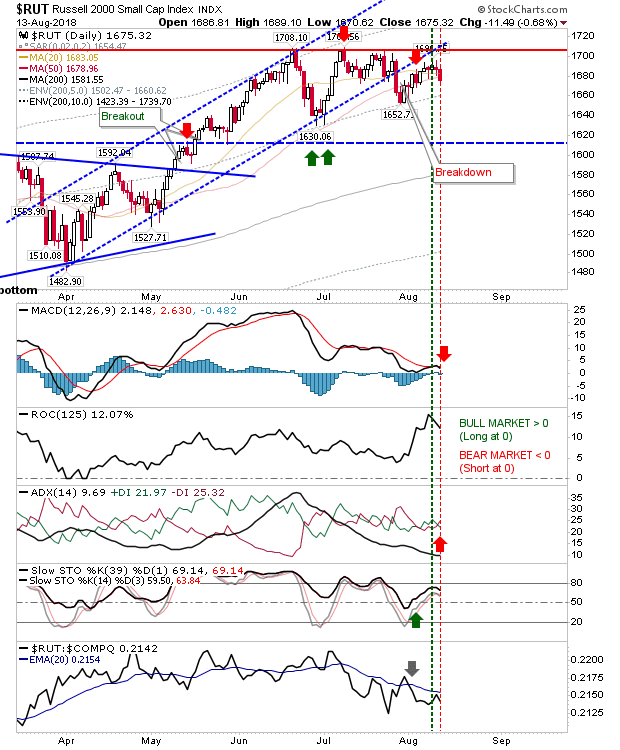 The Nasdaq Summation Index has been in a downward decline since the June peak. 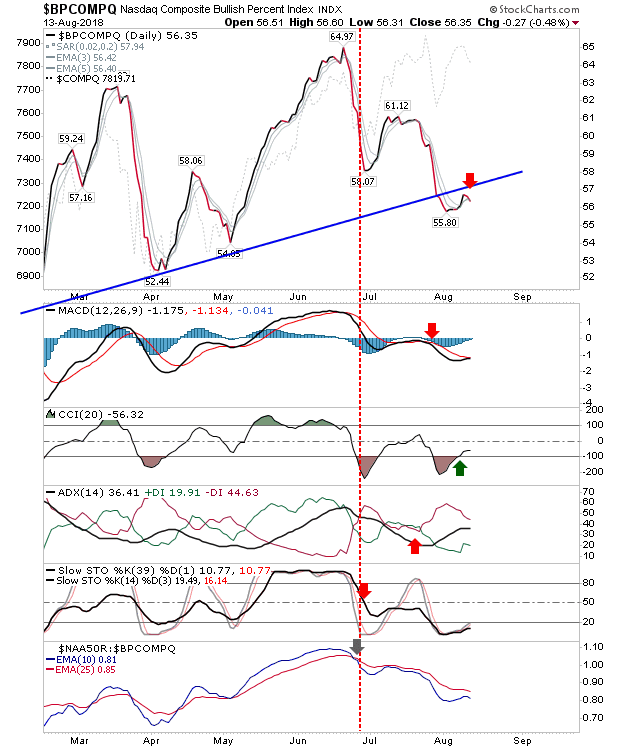 It too broke trendline support and it has yet to offer a swing low. Bear market lows occur at -800 or below but anything less than zero marks a tradable swing low. 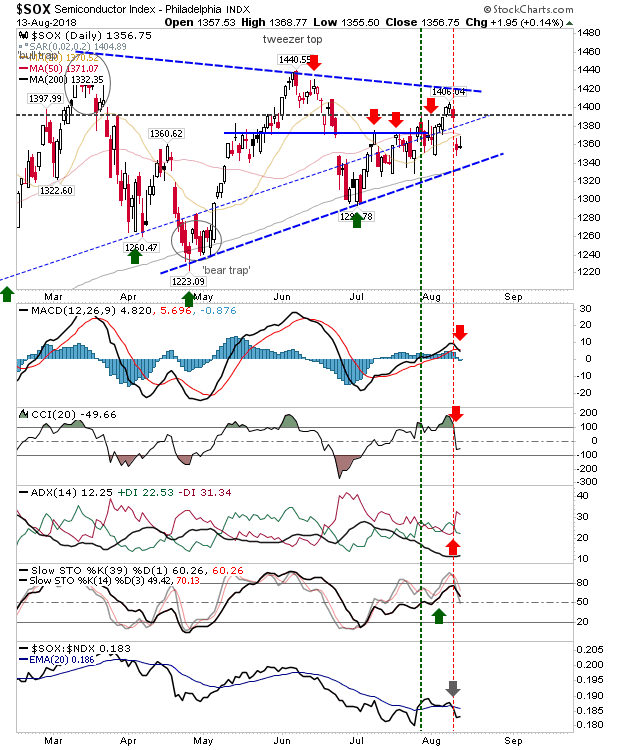 The Semiconductor Index is (triangle) consolidation bound, but today's 'gravestone' doji suggests more selling is on the menu and a test of triangle support is on the cards. For tomorrow, look for further losses in the struggling Russell 2000. 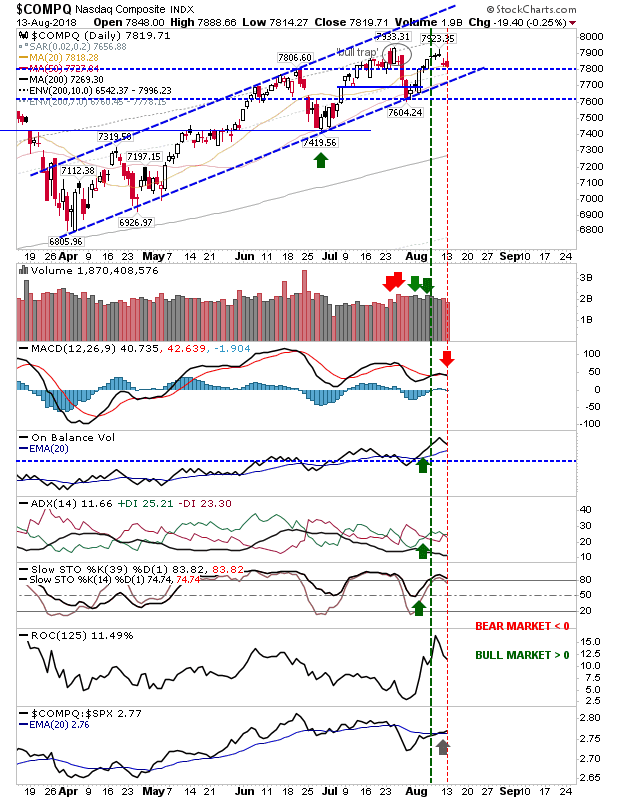 This may have a negative knock-on effect on the Nasdaq and Nasdaq 100, although despite some disappointing technicals the indices look better placed for buyers to take advantage. Large Caps are acting a little forgotten although favoring short-sellers at this time.